The Akron-Canton Regional Foodbank, Greater Cleveland Food Bank, Second Harvest Food Bank of the Mahoning Valley and the Second Harvest Food Bank of North Central Ohio will collaborate once again on the 28th annual Harvest for Hunger Campaign. A new component of this year’s Campaign is the Week of Giving. The Harvest for Hunger Week of Giving is a joint effort among all four food banks and provides an opportunity for community members to get involved in local hunger-relief efforts, while providing fun and tangible ways to be part of the Campaign. 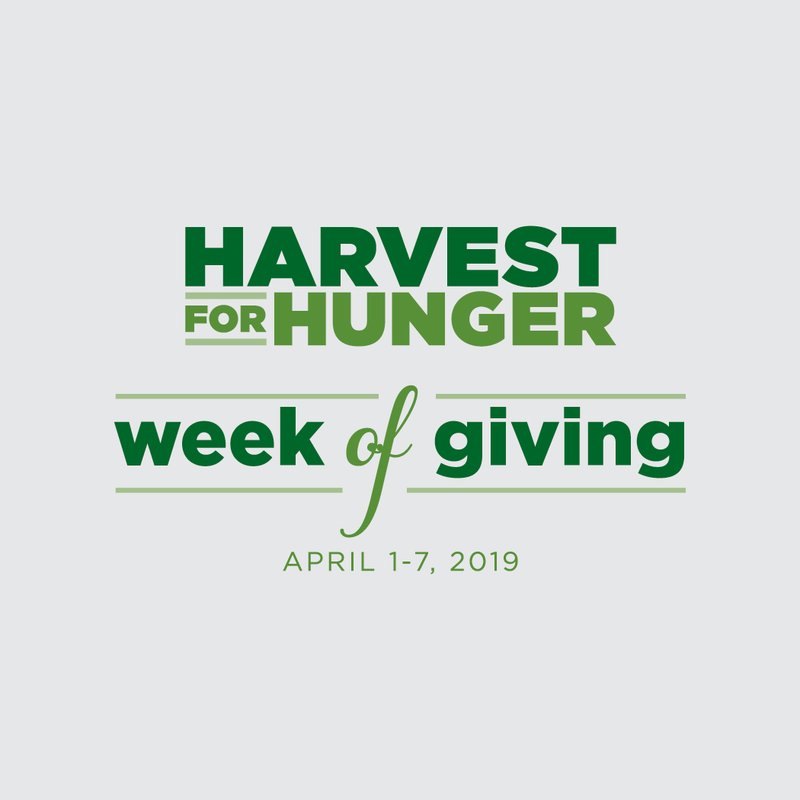 Each food bank will host a variety of coordinated activities during the week of April 1, 2019. Monday, April 1, 2019 – Make a Donation Monday The Goodyear Tire & Rubber Company has generously offered to match all donations on Make a Donation Monday, dollar for dollar, up to $10,000. Make your donation at akroncantonfoodbank.org/wog. Tuesday, April 2, 2019 – Take a Tour Tuesday Visit your Akron-Canton Regional Foodbank, located at 350 Opportunity Parkway in Akron at 12pm, 1pm, 5pm or 6pm. Take a tour of the 83,000 square foot facility and see your donations hard at work. To RSVP, please visit akroncantonfoodbank.org/wog. Wednesday, April 3, 2019 – Volunteer Wednesday Volunteers are crucial to the work of the Foodbank. It’s because of volunteers that your Foodbank is able to provide food and other essential items to community members in need. To volunteer, please visit akroncantonfoodbank.org/volunteer. Thursday, April 4, 2019 – Thankful Thursday Print and snap a photo with a Harvest for Hunger support sign found at akroncantonfoodbank.org/wog. Post and tag the Foodbank on social media and use #HarvestForHunger to show your support for the Campaign. Friday, April 5, 2019 – Food Truck Friday Bring your friends and coworkers to the Canal Place parking lot at 520 S. Main St. in downtown Akron from 11am-1pm for lunch from the Swenson’s food truck. A portion of proceeds will benefit the Harvest for Hunger Campaign. Saturday, April 6, 2019 – Supermarket Saturday Have your groceries bagged by local celebrities, including Summit County Executive Ilene Shapiro, WKYC Channel 3’s Betsy Kling and Amani Abraham, Rock 106.9’s Dan Stansbury and Matt Fantone, Ohio Secretary of State Frank LaRose and more! Celebrity baggers will bag groceries when customers make a $10, $5 or $1 donation at the cash register from 11am-1pm. Participating supermarkets include Giant Eagle Market District at Portage Crossing in Cuyahoga Falls, Giant Eagle on the Strip in North Canton, Buehler’s Fresh Foods in Orville and Buehler’s Fresh Foods in Jackson Township. For a complete listing of celebrities, please visit akroncantonfoodbank.org/wog. The Harvest for Hunger Campaign is the Akron-Canton Regional Foodbank’s largest fundraising initiative and helps support food distribution all year long. Support from the community is imperative to ensure families struggling with hunger have a place to turn during their time of need. 100 percent of all funds raised in the Campaign goes directly to providing free food for the local community. For more information regarding the Harvest for Hunger Campaign, please visit harvestforhunger.org.